Sorry... the 2017 Volkswagen Jetta is no longer being sold as new. Instead, take the first step to a great deal on 2019 Volkswagen Jetta with a free price quote! 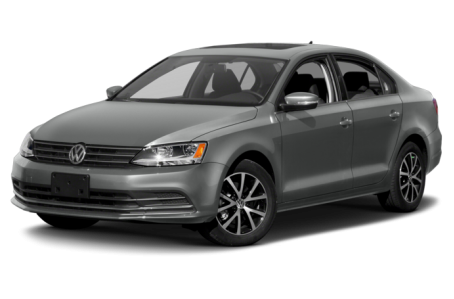 The 2017 Volkswagen Jetta is a compact sedan that competes with the Ford Focus, Mazda3, and Toyota Corolla. This year, the trim levels have been consolidated. It also gains new standard features. The Jetta Hybrid has been discontinued. Four trims are available: the S, SE, SEL, and GLI. The Jetta has subtle styling with moderately proportioned features and clean body lines. The GLI comes with a more aggressive front-end with a honeycomb mesh-pattern at the front grille and lower fascia. Standard features include LED daytime running lights, power/heated side mirrors, and 16-inch wheels. Available features include a sport suspension, turn-signal indicators at the side mirrors, a rear spoiler, a power moonroof, and an 18-inch alloy wheels. Under the hood, the Jetta has three turbocharged 4-cylinder engine options. The base engine is a 150-hp, turbocharged 1.4-liter 4-cylinder. The GLI is driven by a more powerful 210-hp, turbocharged 2.0-liter 4-cylinder. Both engines can be mated to a 5-speed manual or a 6-speed automatic transmission. The SEL trim comes with a 170-hp, turbocharged 1.8-liter 4-cylinder paired to only the 6-speed automatic. Fuel economy for the 1.4-liter models is an EPA-estimated 28/40 mpg city/highway. The SEL has a rating of 25/35 mpg, while the GLI decreases the rating to 23/33 mpg. Inside, the Jetta has a two-tone cloth interior with a 60/40 split-folding rear seat. The center stack features a standard MIB II infotainment system that includes a 6.3-inch touchscreen, Bluetooth connectivity for phone and audio, and a USB port. It can be upgraded with an integrated navigation system, Apple CarPlay/Android Auto compatibility, Car-Net App-Connect, voice recognition, an SD card reader, and a Fender premium audio system. Standard features include air conditioning, cruise control, remote keyless entry, and power windows/locks. Available features include V-Tex leatherette upholstery, a leather-wrapped steering wheel, dual-zone automatic climate control, heated front seats, and push-button start. The Jetta was named a Top Safety Pick Plus by the Insurance Institute for Highway Safety (IIHS). It also earned a full 5-star overall crash test safety rating from the National Highway Traffic Safety Administration (NHTSA). Standard safety features include a backup camera and a tire pressure monitoring system. Available features include a blindspot warning system, rear cross-traffic alert, forward collision warning, automatic braking, and adaptive cruise control. 111 of 114 (97%) consumers said they would recommend this vehicle to a friend.